That’s it–The Writer’s Craft. That’s the name of a required class in our Professional Writing department at Taylor University–a required class that I will be teaching for the first time this fall. I’m so excited to teach this class because we’re going to read great writing, unpack it, understand what makes it great, and learn what we can use to improve our own writing. The class has traditionally used Francine Prose’s book, Reading Like a Writer: A Guide for People Who Love Books and for Those Who Want to Write Them (New York: Harper Perennial, 2007). I love this book because it gives examples of great writing in areas of words, sentences, paragraphs, narration, character, dialogue, details, and gesture. All of this is studied by way of what she calls “close reading,” taking the time to annotate a chosen text and study it carefully. So I’m excited to bring to the students stories from John Steinbeck and Ernest Hemingway and Flannery O’Connor and John Updike and Tim O’Brien and Edgar Allan Poe and James Joyce and Anton Chekov, among others. I can’t wait to have my students do close reading of amazing writing, discuss it, learn from it, be inspired by it, use it. I’m just a little thrilled to teach this class. It is important that writers read “textbooks” about writing–and those textbooks are the great works that have stood the test of time. Prose (don’t you just love that the author’s name is “Prose”?) writes that these great works are “textbooks, private lessons in the art of fiction” (3). What is it about this piece of writing that makes it great? that has stood the test of time? that makes it classic? She continues, “A masterpiece can inspire us by showing us how a writer does something brilliantly” (11). In his wonderful little book Steal Like An Artist, Austin Kleon talks about making sure we artists surround ourselves with other great artists (I talked about this book more in this post). He advises us to be collectors, collecting the things we love. Seeing yourself as part of a creative lineage will help you feel less alone as you start making your own stuff. I hang pictures of my favorite artists in my studio. They’re like friendly ghosts. I can almost feel them pushing me forward as I’m hunched over my desk. So we’ve got our readings, our lesson plans, our pens, and our desire to collect and learn from the greats. What great writers or particular pieces of writing have inspired you? I’m excited for you, Linda. It will be a great class. Francine Prose was born to write about prose! I agree that great writing is inspirational. I’ve been rediscovering books by Mary Stewart and Elizabeth Goudge–books with beautiful descriptions and uplifting messages. Though I’m writing middle grade fiction for twenty-first century kids who will probably never crack open the books I’ve read, I like to inspire myself with good writing, no matter what century it came from. I read Mary Stewart years ago–I think it was her King Arthur series–and couldn’t put it down. Right, language has changed so much that we can’t really be trying to imitate the masters in the classics, but they inspire us into our own writing for our own audiences. Thanks for the comment, Linda! This is good news, Linda. I’d love to take a class like that. I keep Brenda Euland’s ‘If You Want to Write’ in my ‘how to’ bookshelf for those times when I’m bogged down. Yes, excellent book. I’m thinking of adding a page to my blog here of books like that, books I have on my shelf that are the go-to true “textbooks” about writing, because we need those also! Thanks! 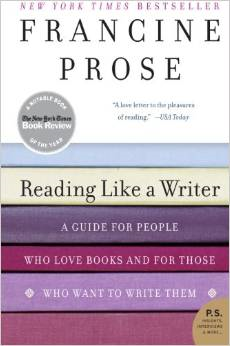 This (and John Gardner’s “On Becoming a Novelist”) is in my top two favorites list! I’ve reviewed both for Catholic Fiction dot Net. I will have to say, Francine rocked my world–she had me pulling out old essays of my own to revisit how well–or not–I had crafted them. And I was also compelled to make a pile of some of my life-long favorite books to compare to what she was conveying. Yep, I can never really chose one of these great manuals over the other. I just refer to them as the all-time Grand Dutchess and Grand Mac-daddy-status handbooks for writers! I know! Amazing isn’t it? I really got tired of reading the great masterpieces and trying to critique them or understand them–I just wanted to ENJOY them at the micro level. As an editor, that’s where I’m at most of the time anyway. Glad it inspired you to revisit past writing!